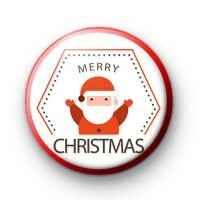 This is a listing for a festive 1 inch button badge. Its has a Red Santa Claus in the middle and the words Merry Christmas. Why not order a few Christmas badges for Stocking Fillers, we have a huge selection of Xmas themed badges so make sure you check them out.